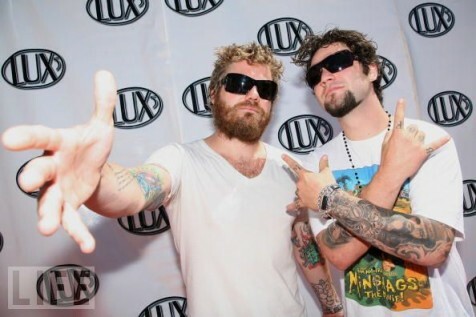 Ryan Dunn (L) and Bam Margera attend the Lux5 Gumball 3000 Orange County Rally at the Hilton Waterfront Beach Resort on August 10, 2008 in Huntington Beach, California. Margera says he would have told Dunn not to drive that night. Bam Margera, Ryan Dunn’s costar on Jackass, told E magazine that he was in a car with Ryan Dunn that flipped eight times in 1996. Dunn died recently in a car crash in suburban Philadelphia when his car skidded off the road and burst into flames, killing Dunn and a passenger. Margera also spoke about his final conversation with Dunn before Dunn went to bar before he died in the crash that night. “Stopping for a beer, be there when I can,” was the last message sent from Dunn the night of the accident. Margera says Dunn wouldn’t have listened to him if he had tried to take away his car keys that night. You can read the whole interview with Margera here.